This article is about non-commuter regional rail. For commuter and suburban railways, see commuter rail. For the former British Rail division, see Regional Railways. For the system in Philadelphia, see SEPTA Regional Rail. The main difference between regional rail and commuter rail is that the latter is focused on moving people between where they live and where they work on a daily basis. Regional rail operates outside major cities. Unlike inter-city, it stops at most or all stations. It provides a service between smaller communities along the line, and also connections with long-distance services. Regional rail typically operates throughout the day but often at low frequency (once per hour or only a few times a day), whereas commuter rail provides a high-frequency service within a conurbation. Regional rail services are much less likely to be profitable than inter-city (mainly because many passengers use monthly passes giving a lower price per ride, and that lower average speed gives less distance, meaning less ticket revenue per hour of operation) and hence require government subsidy. This is justified on social or environmental grounds, and because regional rail services often act as feeders for more profitable inter-city lines. Since their invention, the distinction between regional and long-distance rail has also commonly been the use of multiple-unit propulsion, with longer-distance trains tending to be locomotive-hauled, although the development of trains such as the British Rail Class 390 and V/Line VLocity has blurred this distinction. Shorter regional rail services still usually be operated exclusively by multiple units where they exist, which have a shorter range and operate at lower average speeds than services on inter-city rail networks. Not using a locomotive also provides greater passenger capacity in the commuter role at peak periods. There are trains that are something in between regional and inter-city, like the Oresundtrain (between Copenhagen and three cities in Sweden over 3 hours away) with stopping pattern like a regional train and pass prices attracting work commuters. This list describes the terms used for regional rail in various countries, as described above. Austria ÖBB Regionalzug "Regional train". Calls at every stop. They only convey 2nd class. Belgium NMBS/SNCB lokale trein/train local "Local train"
China China Railway 城际铁路 "Inter-city railway". Starting with C. Runs exclusively inside a region with top speed about 140 – 200 km/h. Czech Republic ČD Osobní vlak, Spěšný vlak "Passenger train", "Semi-fast train"
Denmark DSB, Arriva Regionaltog "Regional train". This category is used for trains calling at every stop. Finland VR Group Taajamajuna (Finnish) (FI), Regionaltåg (Swedish) "Conurbation train". Station announcements use "regional train". Germany DB Regionalbahn "Regional train". This category is used for trains calling at every stop outside urban areas. Previously they were named Nahverkehrszug and even before Personenzug. Germany DB S-Bahn "Suburban train" or "City train". This category is used for trains calling every stop in a city. S-Bahn only operated in cities. In the country it's called "Regionalbahn" (see above). India IR Passenger train "Passenger train" or simply as "Passenger". This category is used for trains stopping at every railway station along its route. Indonesia KAI Kereta Ekonomi Lokal "Local Economy Train". This category is used for trains stopping at every railway station along its route to a major city within an operational area. Exception is when operating in overlapping pattern with Jakarta commuter rail, the train only stops at certain stations. Italy Trenord Treno suburbano (IT) "Suburban train" or "City train". This category is used for trains calling at every stop in the city of Milan. These trains are operated by Trenord, the regional train company for Lombardy. Italy Trenitalia Treno regionale (IT) "Regional train". This category is used for trains calling at every stop, or most stops. Previously, regional trains were named treni locali (local trains). Japan JR group 中距離列車,近郊形電車,アーバンネットワーク(Japanese) (JA) "Mid-distance Train," "Suburban Train," "Urban-Network." These categories are used for trains calling at less stops than commuter trains in city area, and making every stop in suburb or further. Netherlands NS and others Sprinter (NS)/Stoptrein (others) (NL) "Sprinter" or "Stopping train". Connects nearby cities, stops at (almost) all stations, the basic local train service. Norway NSB Regiontog "Regional train". This term used by Norges Statsbaner for medium- and long distance trains; those that do not stop at all stations. Norway doesn't have high speed trains except for short distances. Also long distance trains stop often, since they serve also regional travel and don't try to compete with air travel because of curvy and slow railways. Poland Przewozy Regionalne Pociąg osobowy (PL) "Passenger train"
Serbia Serbian Railways Putnički voz (Passenger train) Short, medium and long distance stopping trains, that stop at all stations between two points. These trains are usually the slowest trains in Serbia, but are most commonly used because of their low price comparing to Brzi voz ("Fast train", stopping only at major stations) and Inter Siti Srbija ("InterCity Serbia", similar to Brzi voz, except that most are international trains). Most Putnički voz trains are consisted of one ŽS 441/ŽS 444 locomotive and one to three coaches or ŽS 412 EMU. There are plans to replace ŽS 412s with new ŽS 413 sets. Spain Renfe Operadora Media Distancia "Medium Distance" (formerly, Regionales). Sweden SJ and more Regionaltåg (SV) "Regional train". The public transport organisations organise both local and regional trains in Sweden, with similar tickets in both cases, with monthly pass prices competitive with car commuting. An exception is around Stockholm County where SJ handles all ticketing including pricing. Otherwise, SJ mostly handles inter-city and high-speed traffic. SJ sells tickets to all regional trains, in parallel with the main operator. Switzerland SBB-CFF-FFS and others Regionalzug (German), Train régional (French), Treno regionale (Italian) "Regional Train". Replaces the former terms Personenzug (German, translates as passenger train) and train omnibus (French) to have a more precise description and basically the same word in all three national languages. Starting in December 2004 the abbreviation Regio was introduced for all languages. Trains named Regio call at every stop. Taiwan Taiwan Railways Administration 區間車 (Chinese) Local trains stop at every stations on main lines; exclusive class on passenger branch lines. Trainsets include: EMU500, EMU700, EMU800, and DRC1000. Turkey TCDD Bölgesel Tren "Regional Train". Stops at (almost) all stations, the basic local train service. 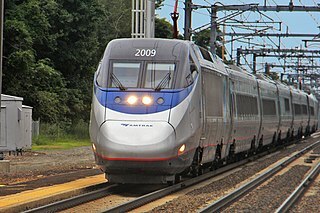 United States Amtrak Amtrak calls its slower trains on the Northeast Corridor "Northeast Regional" to distinguish them from its express Acela trains. Local passenger rail services are generally called "Commuter rail" even when they connect nearby cities. See Commuter rail in North America. Commuter rail, also called suburban rail, is a passenger rail transport service that primarily operates between a city centre and middle to outer suburbs beyond 15 km and commuter towns or other locations that draw large numbers of commuters—people who travel on a daily basis. Trains operate following a schedule at speeds varying from 50 to 225 km/h. Distance charges or zone pricing may be used. Light rail, light rail transit (LRT), or fast tram is a form of urban rail transit using rolling stock similar to a tramway, but operating at a higher capacity, and often on an exclusive right-of-way. A multiple-unit train or simply multiple unit (MU) is a self-propelled train composed of one or more carriages joined together, which when coupled to another multiple unit can be controlled by a single driver, with multiple-unit train control. Norges Statsbaner AS, trading as NSB AS and known in English as the Norwegian State Railways, is a government-owned railway company which operates most passenger train services in Norway. Owned by the Norwegian Ministry of Transport and Communications, it is also engaged in real estate through Rom Eiendom, bus transport through Nettbuss, cargo trains through CargoNet and Swedish train transport through Tågkompaniet. NSB transported 52 million train passengers and 104 million bus passengers in 2009. The current company was established on 1 December 1996, when the former Norwegian State Railways (1883–1996) was split into the new NSB, the infrastructure company the Norwegian National Rail Administration and the Norwegian Railway Inspectorate. In 2002 the freight operations were split to the subsidiary CargoNet, and the maintenance department became Mantena. The bilevel car or double-decker train is a type of rail car that has two levels of passenger accommodation, as opposed to one, increasing passenger capacity. In some countries such vehicles are commonly referred to as dostos, derived from the German Doppelstockwagen. The West Coast Express is a commuter railway serving the Lower Mainland region of British Columbia, Canada. Opened in 1995, it provides a link between Metro Vancouver and the Fraser Valley Regional District, and is the only commuter railway in Western Canada. Tri-Rail is a commuter rail line linking Miami, Fort Lauderdale, and West Palm Beach, Florida, United States. The Tri prefix in the name refers to the three counties served by the railroad: Palm Beach, Broward, and Miami-Dade. Tri-Rail is managed by the South Florida Regional Transportation Authority (SFRTA) along CSX Transportation's former Miami Subdivision, the line now wholly owned by the Florida DOT. The 70.9-mile-long (114.1 km) system has 18 stations along the Southeast Florida coast, and connects directly to Amtrak at numerous stations, and to Metrorail at the Tri-Rail and Metrorail Transfer station and at Miami Airport station. InterCity is the classification applied to certain long-distance passenger train services in Europe. Such trains generally call at major stations only. Intermodal passenger transport, also called mixed-mode commuting, involves using two or more modes of transportation in a journey. Mixed-mode commuting is often used to combine the strengths of various transportation options. A major goal of modern intermodal passenger transport is to reduce dependence on the automobile as the major mode of ground transportation and increase use of public transport. To assist the traveller various intermodal journey planners such as Rome2rio and Google Transit have been devised to help travellers to plan and schedule their journey. Urban rail transit is an all-encompassing term for various types of local rail systems providing passenger service within and around urban or suburban areas. The set of urban rail systems can be roughly subdivided into the following categories, which sometimes overlap because some systems or lines have aspects of multiple types. Public transport in the Wellington Region is well developed compared to other parts of New Zealand. It consists of electric and diesel buses, commuter trains, ferries and a funicular. It also included trams until 1964 and trolleybuses until 2017. The Peninsula Commute, also known as the Southern Pacific Peninsula or just Peninsula, was the common name for commuter rail service between San Jose, California and San Francisco, California on the San Francisco Peninsula. This service ran as a private, for-profit enterprise beginning in 1863. Due to operating losses, the Southern Pacific Railroad (SP) petitioned to discontinue the service in 1977. Subsidies were provided through the California Department of Transportation (Caltrans) in 1980 to continue service, and it was renamed Caltrain. Urban rail, commuter rail, regional rail, or suburban rail plays a key role in public transport in many of the United Kingdom's major cities. Urban rail is defined as a rail service between a central business district and suburbs or other locations that draw large numbers of people on a daily basis. The trains providing such services may be termed commuter trains. Public transportation in the United States refers to publicly-financed mass transit services across the nation. This includes various forms of bus, rail, ferry, and sometimes, airline services. Most established public transit systems are located in central, urban areas where there is enough density and public demand to require public transportation. In more auto-centric suburban localities, public transit is normally, but not always, less frequent and less common. Most public transit services in the United States are either national, regional/commuter, or local, depending on the type of service. Furthermore, sometimes "public transportation" in the United States is an umbrella term used synonymous with "alternative transportation", meaning any form of mobility that excludes driving alone by automobile. This can sometimes include carpooling, vanpooling, on-demand mobility, infrastructure that is fixated toward bicycles, and paratransit service. SEMTA Commuter Rail, also known as the Silver Streak, was a commuter train operated by the Southeastern Michigan Transportation Authority (SEMTA) and the Grand Trunk Western Railroad between Detroit and Pontiac, Michigan. It began in 1974 when SEMTA assumed control of the Grand Trunk's existing commuter trains over the route. SEMTA discontinued operations in 1983. Amtrak began offering intercity service between Detroit and Pontiac in 1994 as part of its Michigan Services.